The former garda’s revelations about penalty-point terminations in 2012 are now the subject of an official inquiry. 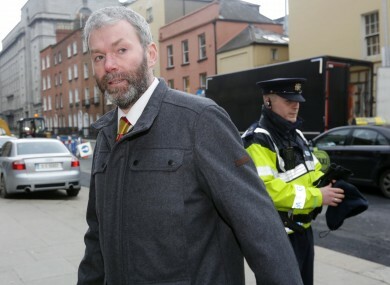 GARDA WHISTLEBLOWER JOHN Wilson has announced his intention to run in May’s local elections. Wilson will stand as an independent candidate in the six-seater Cavan Town-Belturbet area. The former garda said he made the decision to contest the election after a number of locals approached him to do so. If elected, Wilson said he would be a voice for the “many people and communities who feel totally alienated from all levels of government”. One of the main focal points of his campaigns will be repossession of property, he said. Wilson said the Irish government should have followed Iceland’s lead and not “burned the people instead of the banks”. Wilson was a member of An Garda Síochána for more than 30 years before resigning last May. In 2012, he revealed details of penalty-point terminations within the force that are now the subject of an inquiry. The whistleblower will also be campaigning for a drugs unit in Cavan to tackle drugs-related crime. “There needs to be a specialised drugs unit attached to every Garda station in the country,” he added. Wilson admits that politics are “unfamiliar territory” but said that he was “optimistic” about his chances as “there is no point in going into the campaign with a defeatist attitude”. Wilson said it’s unlikely he’ll be getting any campaign advice from his brother Diarmuid – a Fianna Fáil senator and the party’s director of elections. “I love my brother, I respect him greatly, but I’ve never been a member of a political party,” he said. Whether or not he is elected, Wilson said he will remain on the committee of Justice for All, a group set up in the aftermath of the penalty points revelations that aims to help “victims of the Irish Justice system”. “I’m not going into local politics for any personal gain, I am conviction driven. I have to prove I’m more than a one trick pony,” he added. Explainer: Why is Alan Shatter under pressure – and will he survive? Email “‘I’m up against it’: Garda whistleblower to run in local elections”. Feedback on “‘I’m up against it’: Garda whistleblower to run in local elections”.